One of Catapult's great advantages is its ease of handling off the water, making it a true single-hander for racing or cruising, allowing easy catamaran sailing almost anywhere in the UK. The two beach wheels slide down the centreboard slots. Rigging, the boat is lifted briefly each side to lock these in. Coming ashore, they insert while the boat is floating. 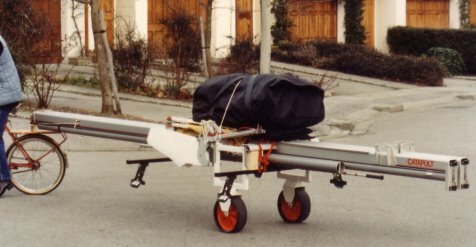 With Catapult being so light, and the maximum hull buoyancy well aft, it is easy to lift most of the boat onto the beach, and the tough inflatable hulls can sit on sand or stones, or a slipway. 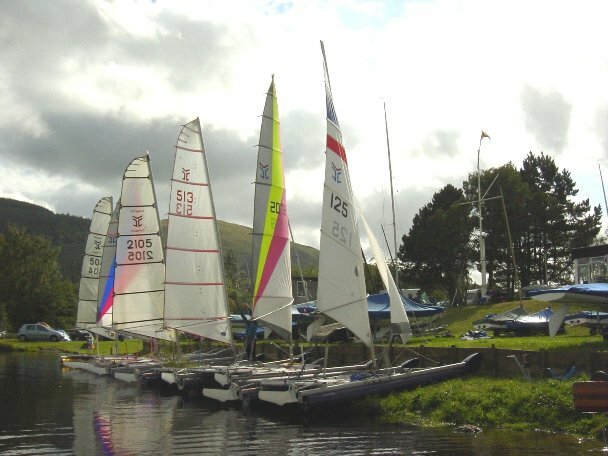 The boats will sit comfortably at the edge of the water between races or during a cruising lunch. Here, right, at Bassenthwaite, they have been lifted, sterns still floating, and landed on the bank. 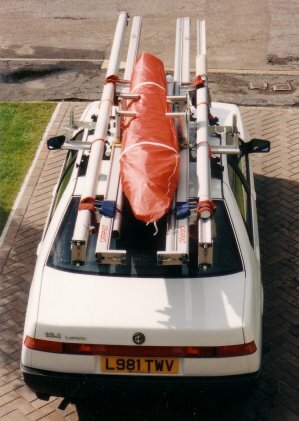 Left: Catapult ready to go, on a small car, the rest of the boat inside. 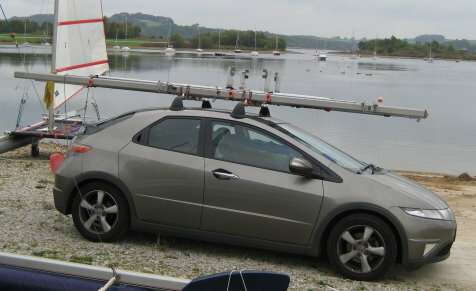 A small car can drive at full motorway speed and the roof load is below 40kg. 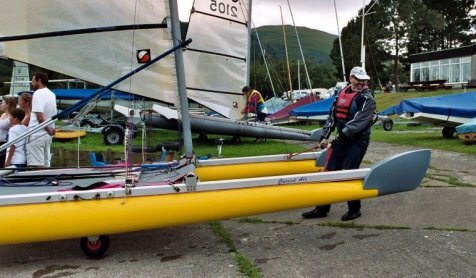 A caravan can be towed, or the boat put up onto a motor-home, so there is no restriction getting to any racing or cruising water. Alternatively (below) if you have one Catapult and no car, you can bike to the (nearby) water. It nicely highlights how a 5-metre racing boat emerges from a small kit. It also gives a good picture of the beach wheels in place in the centreboard slots, in an unusual use.